When Israel was at the border of Canaan, Joshua sent two spies to Jericho to explore the country. These two men went inside the tavern that is owned by a prostitute named Rahab. She received men from various nations and therefore hears news from many different countries. Rachav also heard how the Israëlites went out of Egypt and that the kings across the Jordan were slain by Israël. This made a great impression on Rachav and she was in awe of this god of the Israëlites. Therefore, when the spies came to her, she hid them on top of her roof under the flax stalks. Rachav lied to the king of Jericho, and the king told the soldiers that the men had left again and she told the soldiers to go after them. She did so at the risk of her own life. Joshua 2:8-14, “Now before they lay down, she came up to them on the roof. And said to the men: I know that the Lord has given you the land, and that the terror of you has fallen on us, and that all the inhabitants of the land have melted away before you. For we have heard how the Lord has dried up the water of the Red Sea before you when you came out of Egypt and what you did to the two kings of the Amorites who were beyond the Jordan, to Sihon and Og, whom you utterly destroyed. And when we heard it our hearts melted and neither did there remain any more courage in any man, because of you: for the Lord your G-d, he is G-d in heaven above, and in earth beneath. 12 Now therefore, I pray you, swear unto me by the Lord, since I have shown you kindness, that you will also show kindness unto my father’s house, and give me a true token: And that you will save alive my father, and my mother, and my brethren, and my sisters, and all that they have, and deliver our lives from death. And the men answered her, Our life for yours, if you utter not this our business. And it shall be, when the LORD hath given us the land, that we will deal kindly and truly with you” (Joshua 2:8-14 AV). Rachav begins here with the declaration of her faith in G-d’s intentions and power. With this declaration Rahab shows her faith in the Savior of Israel to the two spies. Rachav is also the first of the inhabitants of the land that shows and declares her loyalty to the Lord, and she is the first to join Israel. Rachav knows and says that the Lord will let Israël be successful and that they will occupy the land. It is seen as a vision and her statement is a prediction. She is rewarded for her faith and her family is spared when the city is destroyed. From that moment Rachav and her family are included in the Jewish people and to this day she lives in the midst of Israel: “But Yehoshua spared Rachav the prostitute, her father’s household and everything she had; and she has continued living with Israël from then until now; because she hid the messengers Yehoshua had sent to reconnoiter Yericho” (Joshua 6:25). In the New Testament: “By trusting, Rachav the prostitute welcomed the spies and therefore did not die along with those who were disobedient” (Hebrews 11:31). The apostle James describes her as someone who was worthy because of her good works, “Likewise, wasn’t Rachav the prostitute also declared righteous because of actions when she welcomed the messengers and sent them out by another route?” (James 2:25). It may be shocking for some, but both also Rachav and Tamar and Bathsheba were all clearly sinners in their lifestyle and yet they are all mothers of the Messiah Yeshua. 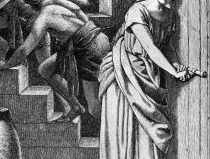 Rachav converted to the God of Israël and left her life as a prostitute behind her when she and her family were saved and joined the people of Israël. For all of us this Passover is another possibility to repent of wrong ways in our lives and to show who is our God and the faith of Rachav can inspire us. She was impressed about the fact that Israël was saved from slavery in Egypt by the Lord. The Passover Lamb had to die in order to save those who trusted in the Lord. Like it is for us today! Let us follow Rachav in her decision to follow the Lord! Pesach sameach we kasher! Happy and kosher Pesach!